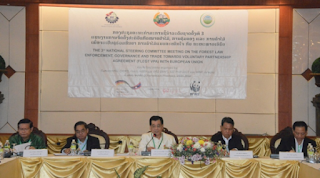 The National Steering Committee held its 3rd meeting for the Lao-EU Forest Law Enforcement, Governance and Trade (FLEGT) process in Champasack Province on Jan 19 to report the progress of the process. The event was co-chaired by Vice-Minister of Agriculture and Forestry, Chief Negotiator for Lao-EU FLEGT VPA (Voluntarily Partnership Agreement), Dr. Phouangparisak Pravongviengkham, with participation of representatives from relevant government agencies, private sector, timber sector, and civil society organisations. A remarkable progress has been presented on the implementation of Prime Minister’s Order No. 15 and the Lao-EU FLEGT process, which both go hand in hand. This meeting was organised with the objective to review the progress of FLEGT VPA process and Lao-EU roadmap. During the third National Steering Committee’s Meeting, Dr. Phouangparisak Pravongviengkham expressed “The FLEGT process supports the direction and enforcement of Prime Minister’s Order No. 15 with its aims to strengthen timber management and suspend all illegal timber trade activities.” “This will also fight deforestation because one of the core elements of the FLEGT process is a definition of legal timber, where it comes from and how to monitor timber movement along the supply chain,” he added. Hand in hand with the Prime Minister’s Order No. 15 that reinforces the forest governance, the FLEGT VPA process works to develop a system for assuring that the timber industry moves forward in compliance with the laws of the Lao PDR. To materialize this, the draft “Decision on the Management and Monitoring of Timber Input and Output in Wood Processing and Trading” was discussed at the National Steering Committee’s Meeting, after a future mandatory national Chain of Custody (COC) has been tested in Attapeu Province. This COC is a documentation system for accounting the timber inputs and outputs of each operator from log landing 2 until it is sold into domestic consumer markets or until it reaches the point of export. The system will show the source of the timber and track it through the operators who trade, transport, and process the timber to ensure that all timber products are in compliance with the laws of Lao PDR. Representatives also discussed the proposal for use of remote sensing technologies for an operational logging and degradation monitoring system. This technology is not only for the detection of forest degradation in the context of REDD+(reducing emissions from deforestation and forest degradation), forest cover survey but also for monitoring logging in conversion areas (for hydropower, mining etc.) within the future FLEGT timber legality assurance system (TLAS). After the announcement of the Prime Minister’s Order No. 15 since May 2016, Lao PDR is now starting to see the fruitful results of stronger forest governance and the intention to solve country’s problem on illegal logging, the Lao-EU FLEGT process is one of the initiatives that helps the Government of Lao PDR to improve this, since the process also seeks to enhance forest governance throughout the entire timber supply chain.